My creative husband dreamed this one up - we found an old watering can in our shed from the previous owner - score! A half-barrel and liner, and a large driftwood log from the beach (only 4 minutes from our home!) make this ever-trickling water feature a calming force on a summer day. The sunny eating area in our kitchen was underused quickly became a dumping area. A pair of chairs from Craigslist make it into a Parisian-style parlour. The rug is woven from various coloured leather scraps and was given to us for free at a yard sale. I simple storage solution on my kitchen counter: The sink area became cluttered and messy-looking when I added the vegetable wash and all-purpose cleaner. 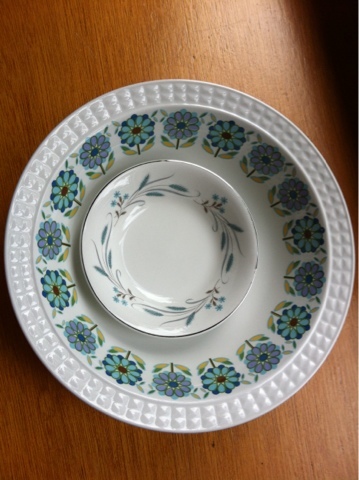 I chose a pretty dish to give it a neater look. In the background you can see my awersome vintage wallpaper backsplash. My succulent garden was born when my husband and I visited a cacti and succulents show in Vancouver, BC, Canada. I have succulents all over the yard as well, but this photo is taken of my little garden on the credenza in the dining room. My reading nook consists of on end of the sofa and this little display. The baby blue rotary phone was found in a thrift shop in Washington State. For the next couple of weeks, I'm going to take you inside my home and show you some of the neat little niches I've designed. I love my home and I am constantly reorganizing and moving things around. I hope that you enjoy this series as much as I have assembling it to share with you! On our fireplace hearth lives a baby blue brontosaurus. The seagulls appear in midair due to wires from the logs below. The trees are a sculpture entitled "300 feet of wire" that I made in 2008. 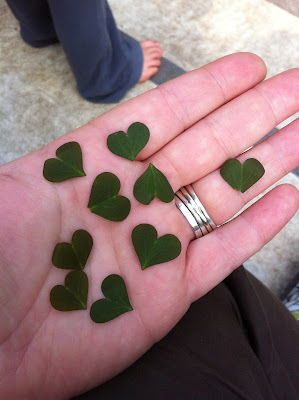 The leaves were individually cut from green plastic 7-Up bottles. 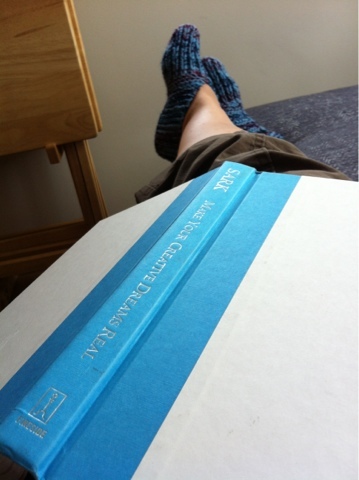 I'm currently reading Sark's "Make Your Creative Dreams Real." It's all about overcoming fears and guiding a transformation of dreams to reality. It's VERY true to life and realistic. As always Sark seems to be writing directly to me! 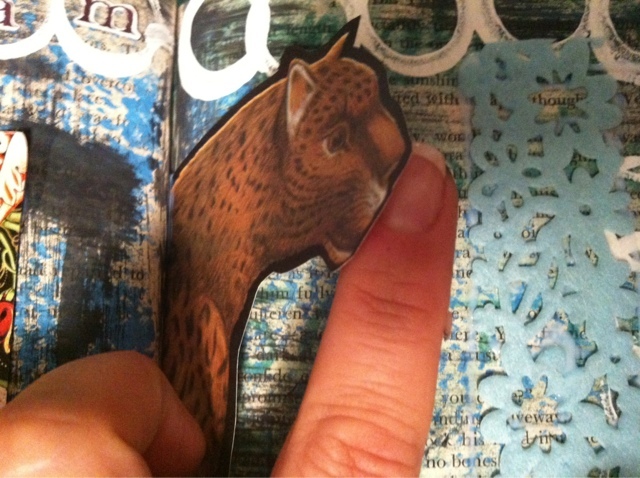 Have you ever experienced a true, soul-quenching, intimate connection with your reading? 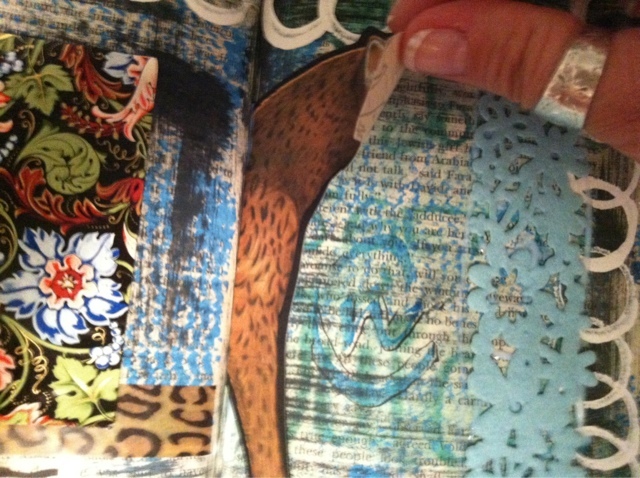 I love Sark's art and the way in which she expresses herself. 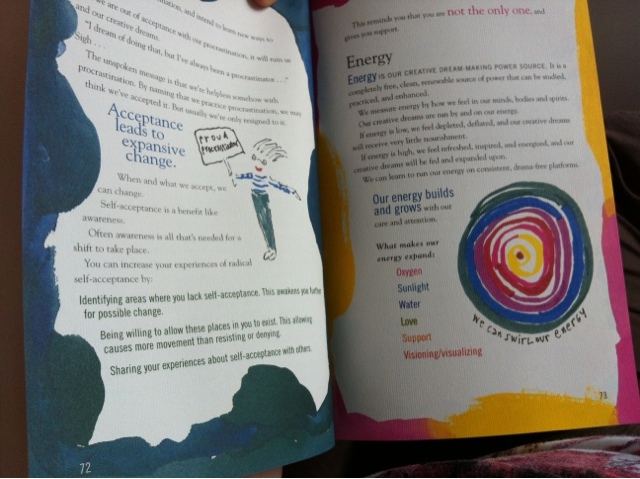 You can see here that the book includes coloured type plus coloured borders, doodles and differing fonts. A VERY effective way of keeping the reader interested! 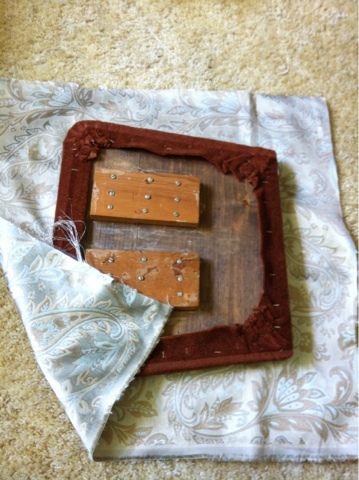 I think I could start a weekly routine of blogging about the treasures that income across at local thrift stores!!! 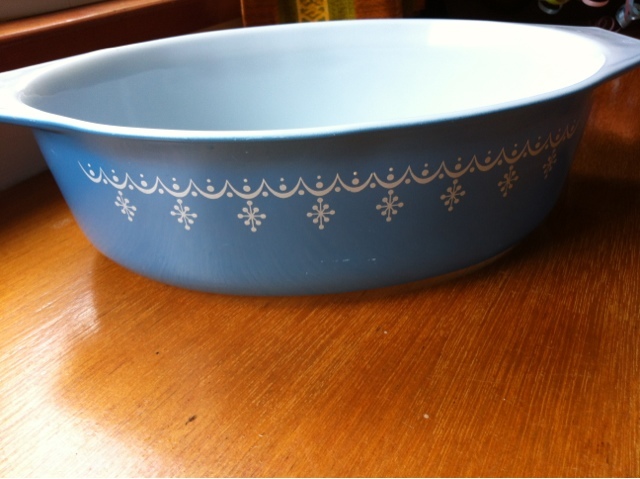 Lately I've been seeking vintage tableware and cookware. These three were a little pricey for thrift store finds but they're all just lovely and I knew that I needed them in my cupboard! These guys were $1 each. Ever feel like you've had too much of LIFE and not enough ART? That's how I felt tonight. 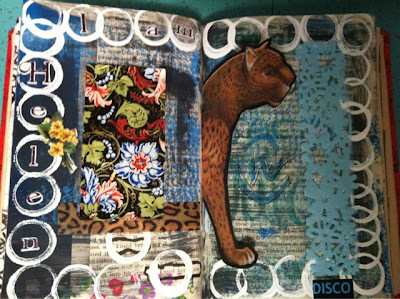 I did a journal spread in my friend Helen's altered book. Now I'm feeling content and ready for tomorrow! Here is the whole spread - I love all of the layers. The light blue pattern on the right is a 3D felted cutout that I found at Urban Source in Vancouver. If you haven't visited Urban Source, you must make a point of it! Remember the dining chairs and table that we bought a couple of weeks ago? Have a look at the whole set in this post. 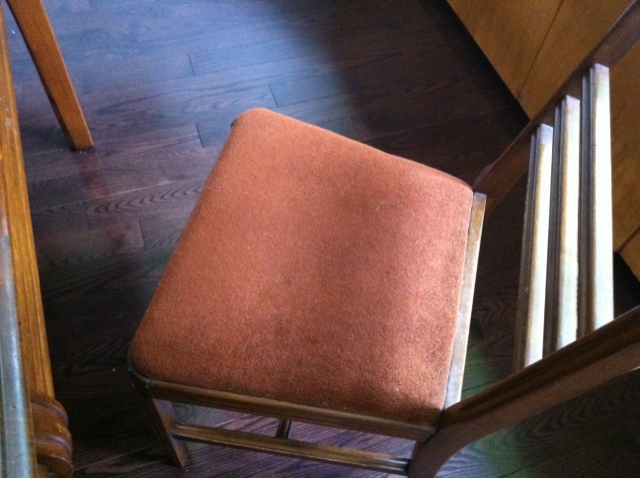 Here is the original seat cover - a rusty red that didn't match with our decor. I unscrewed the four screws holding the seat to the chair frame. Here is the underside of the chair seat. It appears that the previous owner had reinforced the seats with pieces of wood. 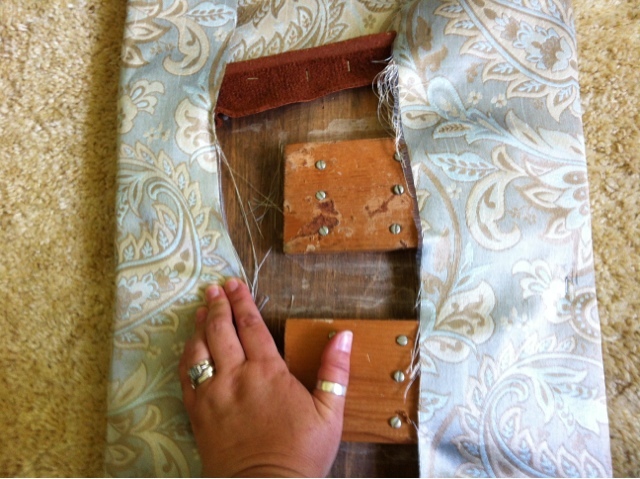 I cut my fabric about 3-4 inches wider than the seat all the way around. 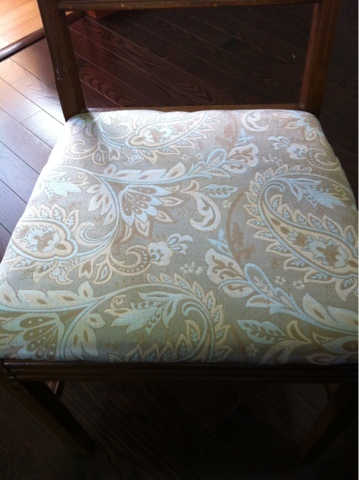 Of course I worked with the fabric wrong side up so that the right side would be on the top of the seat. 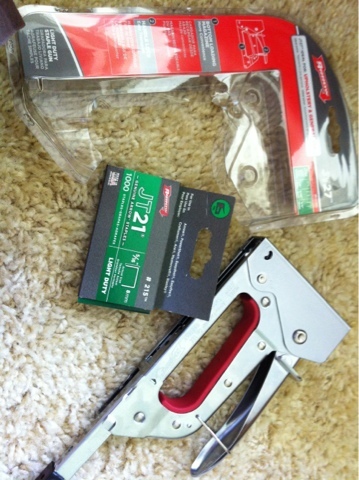 I bought an upholstery staple gun for the job plus a box of staples. Both items were less than $18. 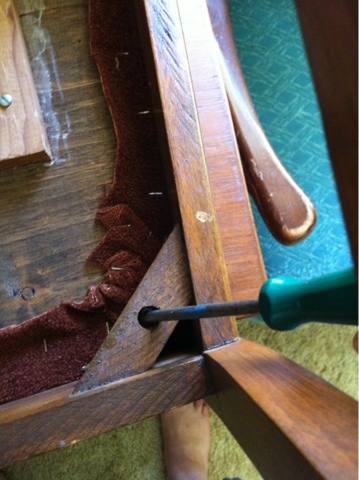 The important thing about reupholstering chair seats is to staple the middles of the side first. For example, I did four staples to begin with: top and bottom middle, then left and right middle. 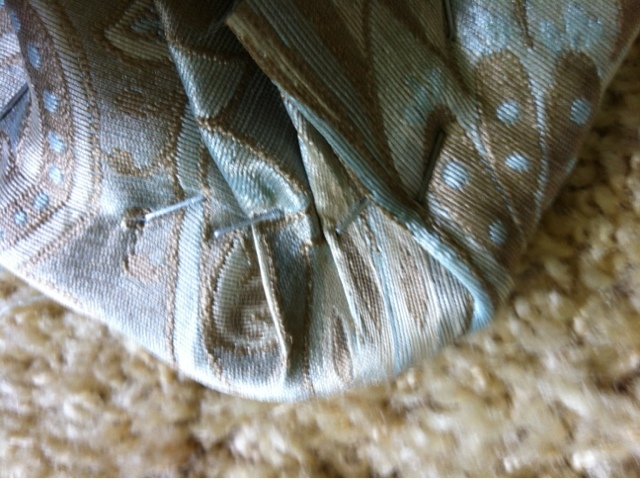 This way I know that my fabric will not have any pleating or bunching. After stapling the middles of each side, I stapled 3-4 staples on either side of my initial four staples. 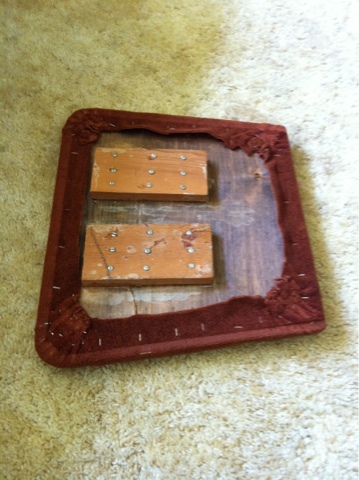 The meant that I had put in a total of about 28-30 staples in and hadn't done anything to the corners yet. I love this picture of the corner - Corners are tricky, but remember that you can put as many staples as you want in - no one is going to be seeing your work! 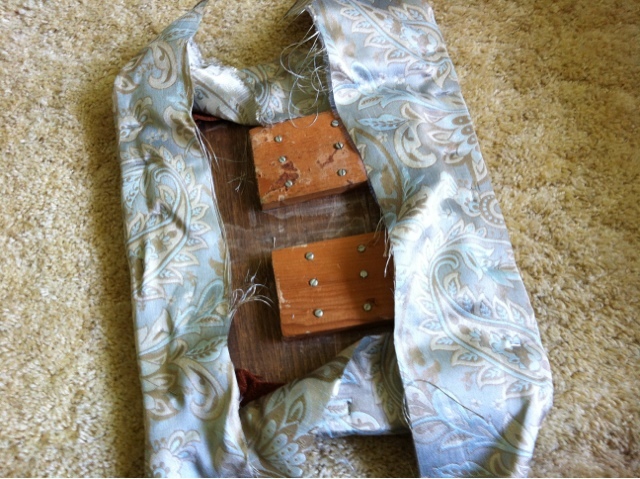 Just take little bits of fabric at a time and fasten them down. You can see each fold and staple that I made here as I rounded the corner. The finished product! A HUGE improvement over the original rust colour in my opinion! Labneh (lab-nay) is a Lebanese cheese made from yogurt. 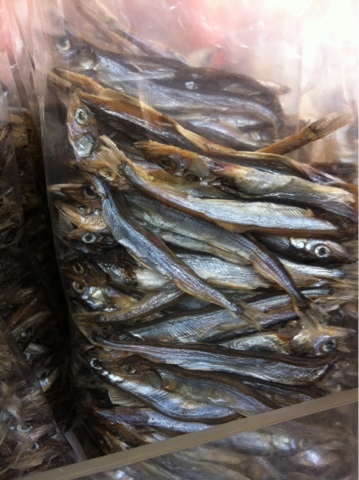 It's similar to cream cheese in consistency but the taste is slightly lighter. It is quite possibly one of the easiest things I've ever made and it is to-die-for delicious! Step One: Take a container of yogurt (full fat, low/non-fat are all good options!) and stir in a pinch of salt. Step Two: Pour into 4-ply of cheesecloth lining a colander in the sink. The first 5-10 minutes will yield a lot of liquid seeping out, hence the sink. 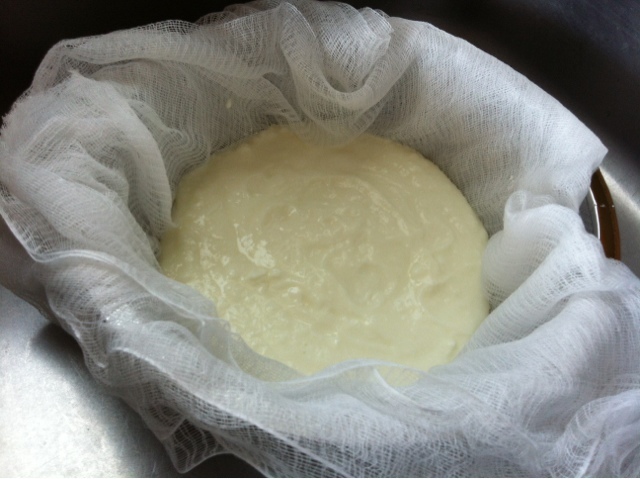 Step Three: After the initial 10-minute drain-off, secure the four corners of your cheesecloth together to make a sac, and hang your cheesecloth sac above a bowl. 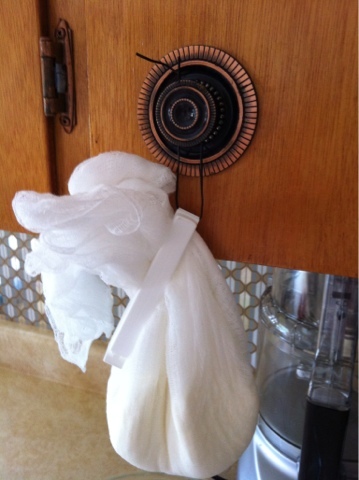 You can see that I used a bag clip to secure my cheesecloth together and wound a piece of wire through the bag clip so that I could hang the sac from a handle in my kitchen. 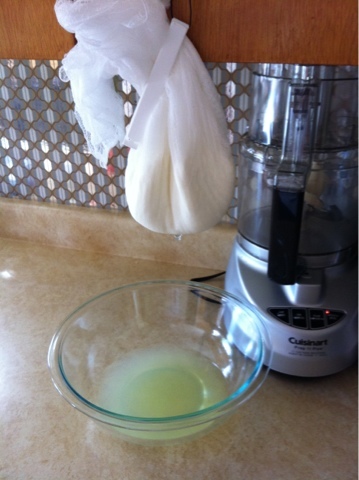 Step Five: There is no photo of this, but after 12-24 hours of dripping, open up your cheesecloth sac to find the luscious creamy cheese that you've made. Make little (walnut-sized) balls and put them onto a plate. Put the plate of balls into the fridge for the cheese to solidify a little more. 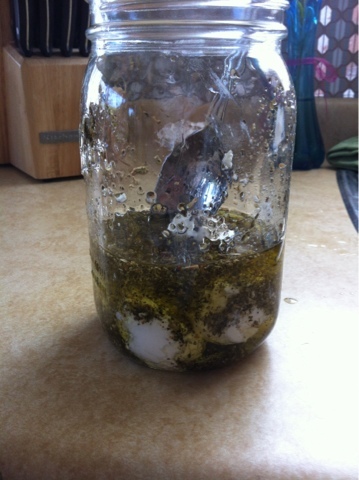 Step Six: Above - put the balls into a jar (or other storage container) and fill to cover with olive oil. At this point you can add a selection of herbs to flavour the oil. I added a mixture of oregano and basil. Step Seven - It's ready to eat right away, but if you want to store it, keep it in the fridge up to two months! 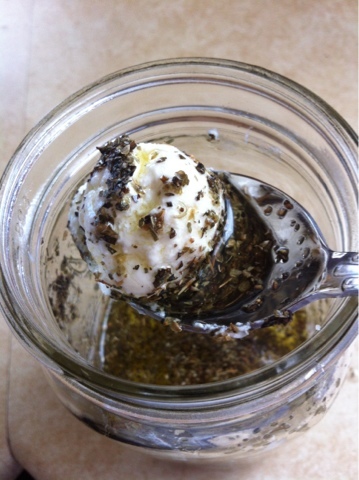 I love how the oil and the herbs stick to the cheese and become a part of it once you spread it! Yum! 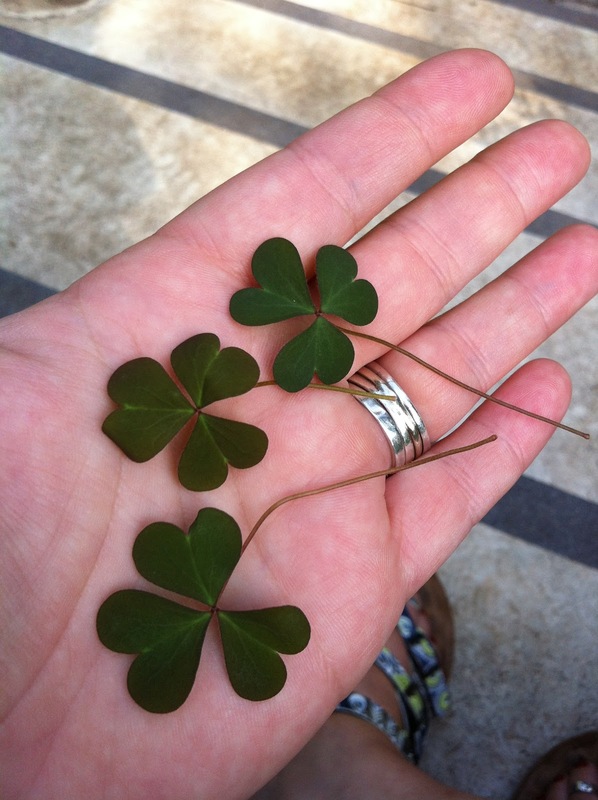 Have you looked - really looked - at a shamrock before? It's made of hearts: plump, happy hearts. 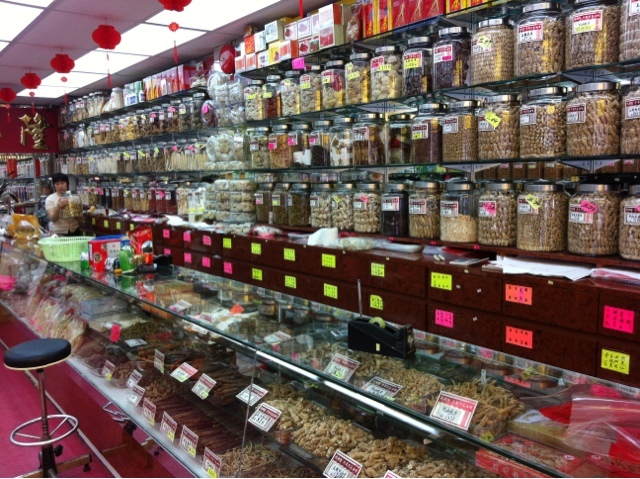 This week I took a walk through Chinatown. I was truly amazed at many of the things that I saw, so I thought I would take some photos and share them with you. 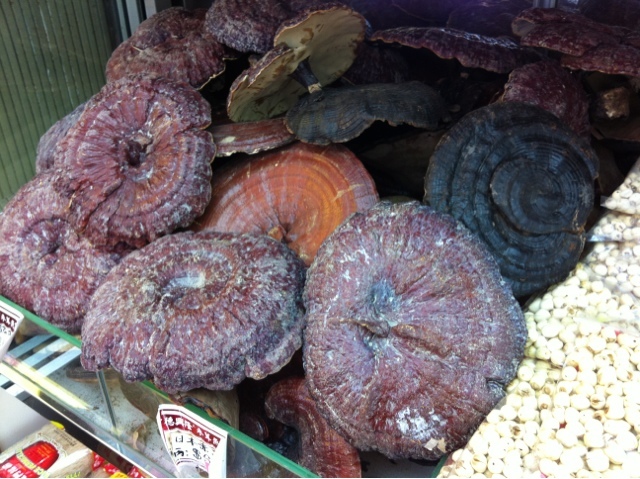 There were rows upon rows of mysterious roots, leaves and fungi. 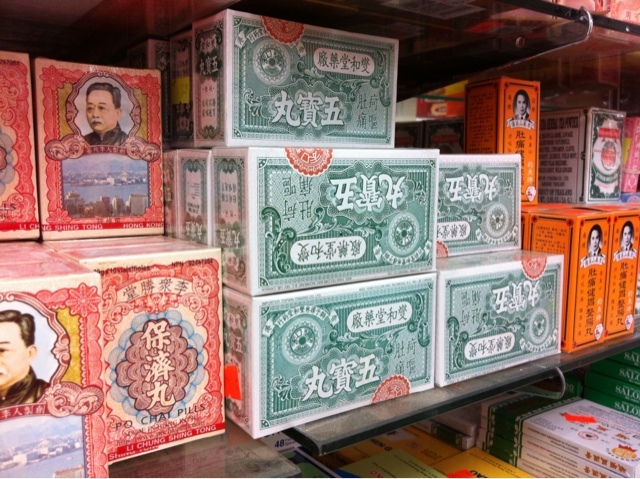 I had no idea what 98% of the products were, but I loved the ways they were displayed! 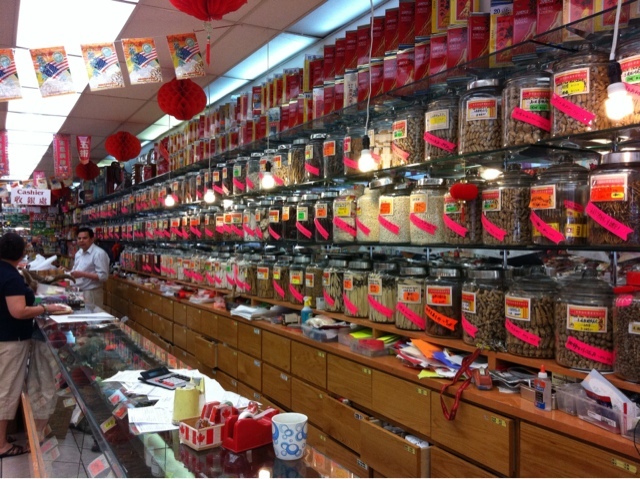 This is a DIFFERENT herb shop with a similar organization system - jars and drawers underneath. 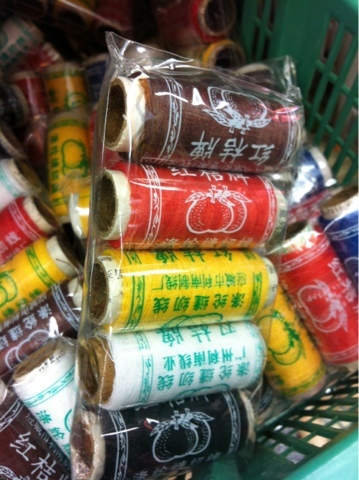 This little package of thread was only a buck and had images printed over the wound spools. 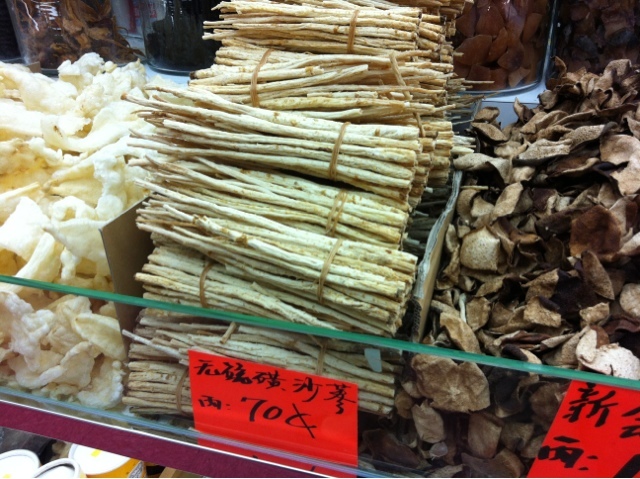 Shopping in Chinatown made me realize how much I DON'T know about cooking and herbs. I found the experience a little overwhelming. I'm not sure that I would want to learn if I had such large quantities and varieties to choose from! At the mouth of Roberts Creek, there is a community area with picnic tables and a breakwater. You can click on this link to see a bit more about this tiny community. Anyhow, every year the community gets together to paint parts of a gigantic artist-designed mandala on the cement! I loooooove mandalas, as you probably already know! 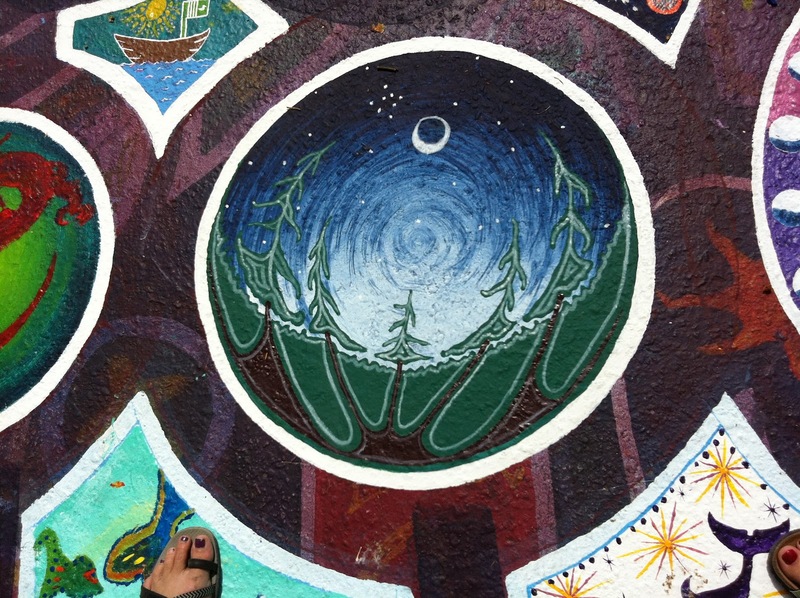 Check out some of the mandalas from past years here. Here is a shot of one of my favourite parts of the mandalas from this year. If you only click on one link from this post, click on this one!